¡수퍼스케치! 시리즈는 SUPER C۞L۞RSUPER 가 개최하는아티스트와 뮤지션의 만남이자,톡톡튀는 프리즈믹한 컨셉과 테마로 아티스트,밴드, 관객이 모두 함께 하는 비쥬얼 아트 파티이다. 라이브 음악 공연이 계속되는 동안 빈티지 프로젝터와 공중에 설치된 스크린을 통해 보여지는 라이브 드로잉, 그림자아트, 사이키델릭 아트가 함께 펼쳐진다. 초등학교시절, 교실 안에서나 볼 수 있었을법한 아날로그 감성의 OHP 프로젝터와 오색 투명한 물감들이 뮤지션들의 라이브 공연과 어우러져 오감을 자극하는 근사한 순간들을 끊임없이 펼쳐낸다. 따스한 6월의 첫째 날, 서울에서 가장 인기있는 지하철 역 중의 하나인 신도림 역내 아트갤러리 고리에서 진행될 슈퍼스케치에는 공공 미술과 음악이 결합된 감각적이고 프로그레시브한 최초의 그 무엇이 여러분을 기다리고 있을 것이다. We’re taking over SINDORIM station!! The now-legendary ¡SUPER SKETCH! series is a hookup between artists and musicians organized by SUPER C۞L۞R SUPER. Every event brings the artists, the bands, the audience and the party together through the prism of a special concept or theme. Super Sketch is a live platter of drawing, art, shadow theater, and psychedelic visuals performed on vintage overhead projectors. The hands-on and analog projector art performances range from transparent puppetry to watercolor compositions displayed through classic classroom overhead projectors. Art runs throughout the night on multiple overhead hanging screens, in time with live music. 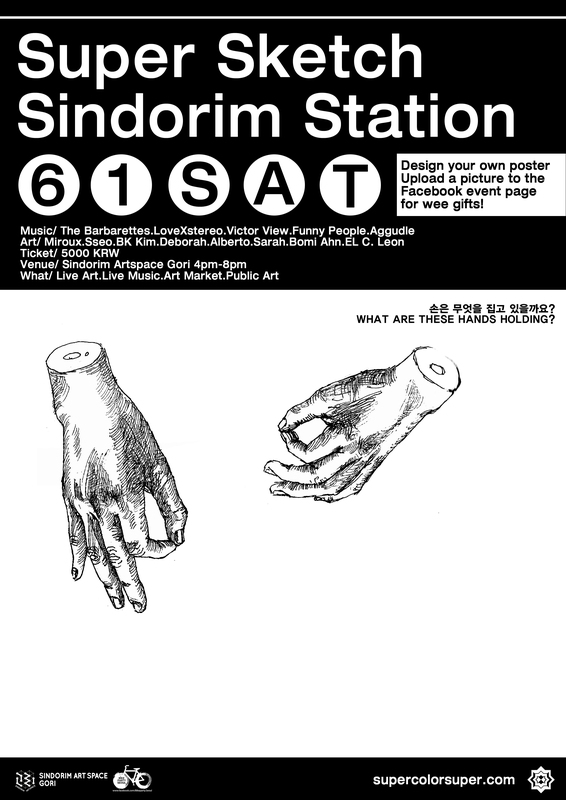 For the first time ever, SUPER SKETCH will take over a section inside Sindorim station in a wash of visuals, music for an all-day event perfect for the warm JUNE. Design your own poster and upload a picture to this page. When you upload the poster choose 1 gift you like below! 아래 링크된 미완성 포스터들 중 가장 마음에 드는 것을 골라 여러분의 그림과 재치로 완성시켜 주세요.페이스 북 이벤트 페이지에 올려주신 모든 분들은 아래의 선물 두 가지 중 하나를 선택하실 수 있습니다! Pingback: Gig of the Week: Super Sketch Underground, June 1st | Trickster.Trickster.